Combine 1 1/2 cups flour, baking powder, paprika, curry powder, salt, cayenne pepper and beer in a large bowl. Dredge catfish strips in 1/2 cup flour. 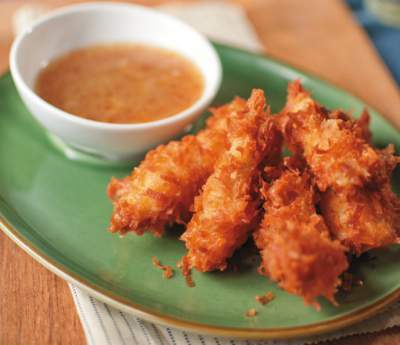 Dip strips in beer batter and roll in coconut. Fry coated strips in deep, hot oil (350 degrees F) until coconut is golden brown. Drain on paper towels. Place on serving dish with Sweet Dipping Sauce. Sweet Dipping Sauce: Mix above ingredients.